Chain link fences are incredibly popular thanks to their affordable cost and durability, but they can be difficult to style and make your own. Chain link fencing is one of the most durable and easy to deal with, but that doesn’t mean it can go without care. From time to time you’ll want to perform some simple care measures to make sure your fence lasts and looks good for years to come. With that in mind, it’s essential to have a fair understanding of what your fence will need to ensure you’re treating it right. Although chain link is quite durable and able to withstand the elements better than most, it still needs some help to make sure it doesn’t become vulnerable. To that end, a simple finish of rust-resistant paint will do the trick perfectly. 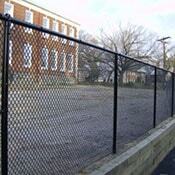 Inevitably dirt, grass clippings, stray leaves, and branches will all accumulate on or around your chain link fence. Not only can these hold moisture and cause rust and damage, but they keep your fence from looking new too. To make sure everything is at its best, give your fence a thorough clean between seasons with soapy water. When clean, add a layer of wax than oil the fence’s springs, joints, and latches with mineral oil. Oiling will prevent your gate from sticking. If you choose to paint your fence, make sure it’s thoroughly dry between layers to prevent flaking and dripping. As you’re performing your maintenance routine keep an eye out for loose nails, screws, and bolts, as well as for any areas of the fence that might need work. If a post is beginning to come loose for example, you’ll want to repair any loose items, so further damage doesn’t occur. Once you’ve completed the full care checklist, make sure to repeat it frequently. A thorough clean and repair should be done as needed with washing done twice a year. Smaller checks and care can be done on a monthly basis. This entry was posted on Friday, June 15th, 2018 at 10:57 am. Both comments and pings are currently closed.